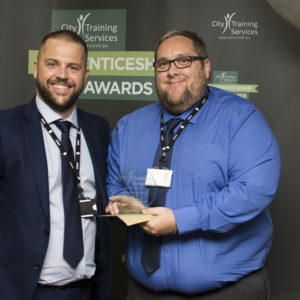 Apprenticeship success stories were celebrated at the City Training Services Apprenticeship Awards 2018. 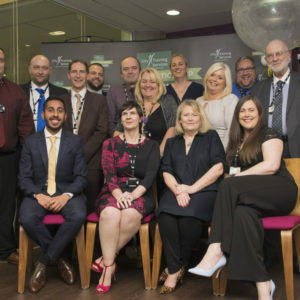 MP for Bradford South, Judith Cummins, was among the guests at the event recognising the achievements of apprentices, trainees and their employers in a range of subject areas including business, engineering, pharmacy, dental nursing and childcare. 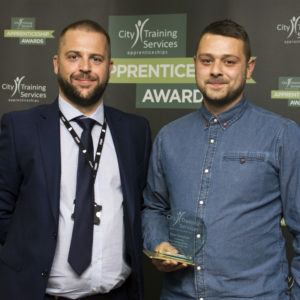 The night’s big prize, the overall Apprentice of the Year title, went to Ryan Davidson, a refrigeration and air conditioning engineer with DNM Engineering, based in Wetherby. 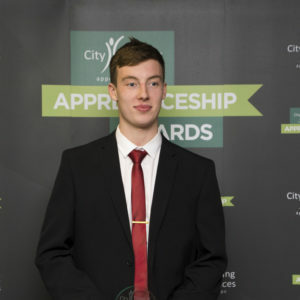 Ryan, from York, said: “I am extremely happy and proud of myself to have won the Apprentice of the Year award. 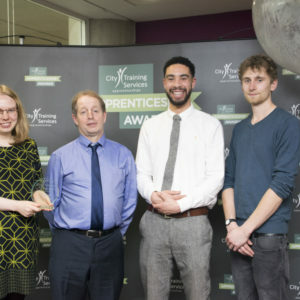 In nominating Ryan for the award, his tutors described him as a hard worker with a clear determination to succeed for himself and his family. Damian Rushton, Operations Director at DNM Engineering, said: “We are as pleased as punch for Ryan. “We are trying to build a brand of engineers that are the best in the field and I think everything we are trying to build as a brand, Ryan has showcased in winning this award. 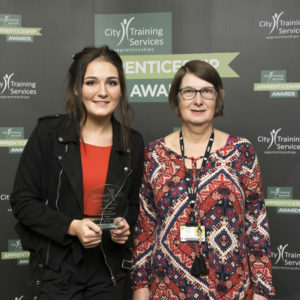 Among the other winners was Keeley Brook of Thackley who was named Higher Level Apprentice of the Year, after completing a Level 5 qualification in Leadership and Management while working for Bradford Council Children’s Services in the Early Help and Prevention team. 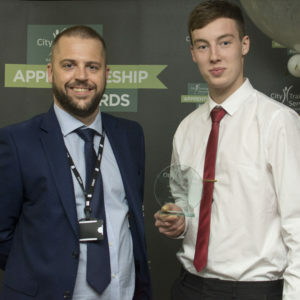 The Level 2 Apprentice of the Year prize was won by Dion Walton, a security engineer with Total Integrated Solutions Ltd. 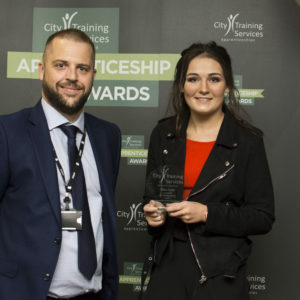 The Level 3 Apprentice of the Year prize was won jointly by James Higgins of GSE Electrical and Chloe Taylor of Steeton Pharmacy. 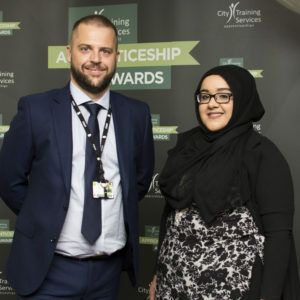 Sana Ahmed walked away with the Traineeship of the Year trophy for impressing in her role at St Edmund’s Nursery in Girlington. 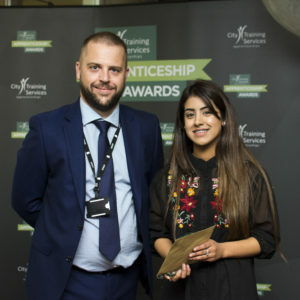 Sehrish Hussain, of Horton Grange Primary School, was presented with the Overcoming Adversity Award having excelled in her apprenticeship despite having caring responsibilities for two family members. 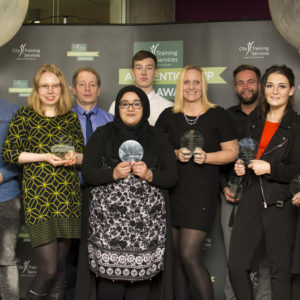 The University of Leeds was named the Levy Employer of the Year and Hurlfield Dental in Sheffield took the SME Employer of Year title. 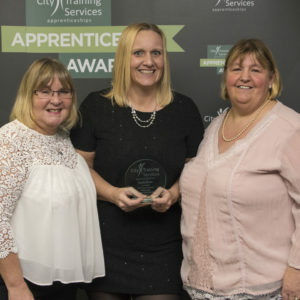 City Training Services, which is Bradford College’s apprenticeship provider, is the number one provider of 16-18-year-old apprenticeships in the Leeds City Region. The evening was sponsored by Banner, 4Imprint, Telegraph & Argus, City & Guilds and GEM Compliance. 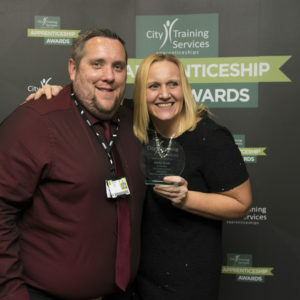 For more information about apprenticeships call 01274 728316, go to www.citytraining.org.uk, e-mail info@citytraining.org.uk or pop along to speak to staff at the open day on Saturday, December 8, 11am-2pm, held at Bradford College’s David Hockney Building.